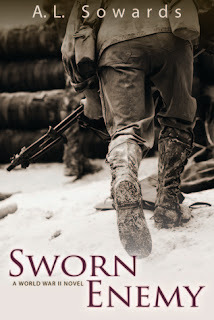 Sworn Enemy is the second historical suspense put out by A.L. Sowards. I really enjoyed the first one and the second one was just as good. We continue with the adventures of Peter and Genevieve, who we met in the first book, although Sworn Enemy is a stand alone novel. (I was glad I'd read the first one so I knew the background of Peter and Genevieve though.) This time, Peter is part of an elite group that is trying to stop a communist takeover and that's not easy. I loved his part of the book because it's full of spies and traitors and awesome action. And, well, I love Peter. Genevieve's story is also good, but a little more sedate if we're comparing the two. (Can you compare action heroes and heroines? On a scale of Alias to Jack Bauer to Mission Impossible? I don't know.) Anyway, Genevieve's one tough cookie with all she goes through. I was definitely drawn in from the beginning with the connection between Genevieve and Peter and the danger they face. The opening chapters were seriously ones I couldn't put down and told myself I'd just read one more page, one more page, until I was on chapter five! It's a great opening. Sowards strength is how accurate her setting is and how she draws her characters within the time period. (I learned some facts about the war in Romania I didn't know.) She has obviously done her research and makes it feel real to the reader. There were a few pacing issues where the details did bog down the story a bit, but overall I thought the author worked it and really added to the authenticity of the story. I love the suspense aspect and how the author ramps up the tension in each succeeding chapter. I'm interested to see where she takes her story next. I definitely recommend this story to any historical fiction lover. June 1944. As World War II rages, the people of Eastern Europe are hopelessly trapped between two formidable forces: Hitler’s Germany and Stalin’s Soviet Union. In their midst, a band of heroes works to defend against the inevitable Communist takeover. Thank for the review, Julie! Are You a To-Do List Person?